Women’s issues in Arab media: finding a place, finding the words. US: 5 reasons voter id bills impact women. Women’s issues in Arab media: finding a place, finding the words Reuters AlertNet “Lebanese women won the right to vote and be elected in 1951 but are only 2% of Parliament today, and have inherited those seats from their deceased husbands”. Leyla Awada, a lawyer and women’s rights activist, paused and looked around the training room. Her comment was met with surprised stares and indignant throat clearing. She was addressing a group of twelve journalists from Algeria, Egypt, Morocco, Tunisia, Jordan, Lebanon, Syria and the United Arab Emirates, who had gathered at Lebanese American University, in Beirut, to learn more about the plight of women, their rights and opportunities, or lack thereof. Addressing gender inequality through advertisements The Stylus …Women throughout the world face laws and social stigmas preventing them from being equal with their male counterparts. Did you know women in Saudi Arabia are prohibited from driving a car or riding a bicycle on public roads? Or that women can’t legally own land in countries such as Chile and Lesotho? In Egypt, women aren’t allowed to have access to a legal court. This means if women want out of a loveless or abusive marriage, they’re out of luck even though men are allowed a divorce after an oral renunciation registered with the court. I’m not stating these facts to guilt you into paying attention during lectures on women’s rights. It’s important to know that women still don’t have some of the basic rights men have called their own for hundreds of years. Stacey Kincaid is elected Fairfax County’s first female sheriff Washington Post Fairfax voters elected the first female sheriff in the county’s history Tuesday, as Stacey Kincaid, a 26-year veteran of the sheriff’s department, cruised to a double-digit lead over her closest opponent. In an interview, Kincaid said she had thought about running for sheriff throughout her career. “I’m looking forward to moving our agency forward, not only as the first woman but also as the only person on the ticket who has any experience with the sheriff’s department,” she said Tuesday night. Five reasons voter identification bills disproportionately impact women Washington Post (blog) Voting-rights advocates are pushing a new line of attack on laws that require voters to show identification at the polls: The laws, they say, disproportionately impact women. There’s anecdotal evidence in Texas, where state Sen. Wendy Davis (D) was among those who had to sign an affidavit before casting her ballot because her voter record didn’t include her middle name (Davis’s likely general election opponent in her bid for governor, Attorney General Greg Abbott, also had to sign an affidavit). Two playbooks for defending against the ‘war on women’ Washington Times …It was a more of an uphill battle for Mr. Cuccinelli in Virginia, where Mr. McAuliffe held a double-digit edge among women in the preliminary exit polls. Former Rep. Thomas M. Davis III, Virginia Republican, said Mr. Cuccinelli suffered from sponsoring some “goofy bills” while in the state legislature. Gender inequality Making room for girls The Economist (blog) N THIS week’s print edition we look at an important issue in development economics: how to reduce the gap between the number of girls and boys being educated in poor countries. Economists see reducing sexual inequality in education as a vital part of promoting development. The failure to educate girls limits economic growth in the developing world by wasting human capital. As a result, the UN set itself the target of eliminating gender disparity in education at all levels by 2015, as one of its Millennium Development Goals. Although places like China, Bangladesh and Indonesia look likely to achieve the target, Africa, in particular, will not. 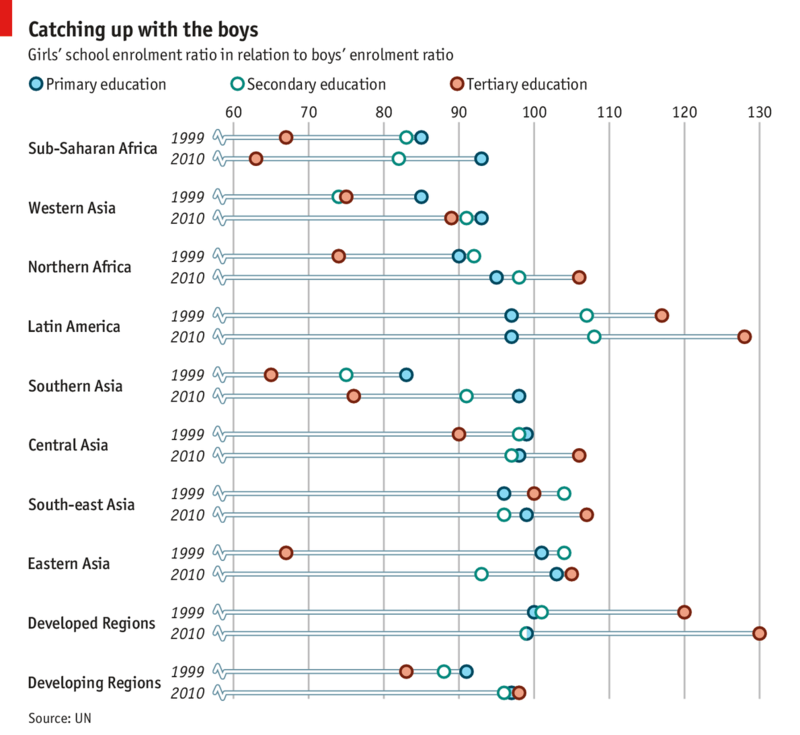 For every 100 boys in secondary school on the continent in 2010, there were only 82 girls. The most common response is to channel more money to girls’ education. UN schemes finance school places for girls in 15 sub-Saharan countries. NGOs have got involved too. Camfed, a charity, now pays for almost 100,000 girls to be educated in Ghana, Malawi, Tanzania, Zambia and Zimbabwe. Transgender controversies can lead to ‘gender panic,’ study finds Science Codex …Since the 1960s, American society has tended to uphold values of autonomy and equality, including gender self-identity, Schilt said. Transgender people typically are accepted in “non-sexual” spaces like the workplace. But acceptance hits a wall when it comes to places reserved for women. In the case of New York birth certificates, the “panic” centered on how such a policy could lead to granting access to women’s bathrooms and locker rooms for individuals who identify as women but have male anatomies. Previous postWhy Disability is a Feminist Issue. Women’s roles in horror films.